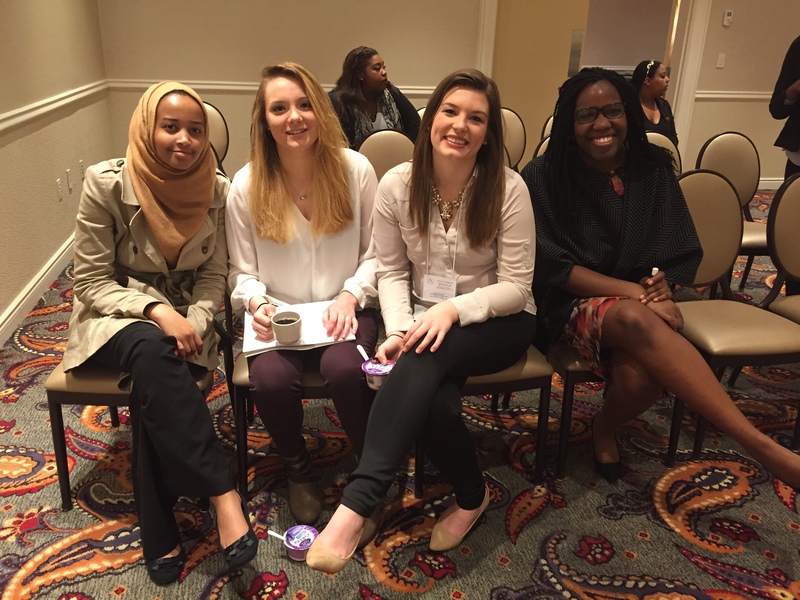 Students escape to Madagascar via Washington, D.C.
Reem Elhafiz Abdalla, Jillian Dunn, Lillie Gabreski and Dalia Tenda Batuuka represented Penn State Behrend at Howard University’s 14th Annual National Model African Union Summit last month. Dalia Tenda Batuuka, Jillian Dunn, Lillie Gabreski and Reem Elhafiz Abdalla are not natives of Madagascar. None of them has ever stepped foot in the country. Talk to any of these four Penn State Behrend students for even a few minutes though, and you might just think they were native-born Malagasy. Last month, the students attended and participated in Howard University’s 14th Annual National Model African Union Summit. Sponsored by the African Union Mission and Member State Embassies in Washington, D.C., the four-day summit is a simulation of the proceedings of the African Union, requiring participants to research their assigned countries in-depth before attending the conference. This marked the first time that Penn State Behrend was represented at the summit, held in February with more than 45 colleges and universities participating. The Behrend students’ assigned country was, of course, Madagascar. The group represented the college well, winning the Michelle Tooley Outstanding Delegation in Committee Award in recognition of their performance on the Social Matters Committee. “Students really do have to act as delegates and adopt the stance of the country they’re representing,” said Naaborle Sackeyfio, a lecturer in comparative politics who also attended the summit. The students chose to participate after taking Sackeyfio’s Introduction to Contemporary Africa course during the fall semester. “We were in the course together, and Dr. Sackeyfio mentioned this summit. It just seemed like such a great opportunity,” said Batuuka, a first-year psychology major. Each student was assigned a different committee for the summit, in this case Economics (Gabreski), Peace and Security (Batuuka), Social Matters (Abdalla) and Regional Economic Matters (Dunn). This meant that the group had plenty of studying to do beforehand. “The whole point was to go there and play the role of actual delegates from Madagascar, so you had to be very familiar with the country in advance,” Batuuka said. The group met several times a week and spent long hours preparing for the event. There were times during the summit where other countries’ delegates would call their expertise into question, but the students held their ground. “People would contest things over even the smallest words. There were times where you definitely had to stand up and make your case heard,” said Gabreski, a senior political science major. “The margin for error was very small,” added Dunn, a sophomore political science major. While the students were happy to receive an award for how they represented Madagascar, it was not the only thing they took away from the summit. This entry was posted in Around campus, Fun stuff, School of Humanities and Social Sciences and tagged Behrend, Howard University, Madagascar, National Model African Union Summit, Penn State Erie. Bookmark the permalink.